Joe’s Gone Diving offers competitive prices for our PADI dive courses in Bali. All our recreational PADI dive courses include everything you need to get your PADI certification, including equipment rental, certification fees and manuals. Below you will find an overview of our costs for our dive courses. For an overview of our rates for professional courses, please visit our Pro prices page. For an overview of our rates for fun dives and dive safaris, please visit our Dive Pricing page. Looking for a more tailored package? Just drop us an email through our contact us page. Courses include: all required study materials, unlimited access to the most up-to-date online version of the PADI Manual for open water, advanced and rescue for the respective courses, PADI Certification fee, all scuba equipment, PADI Instructor, lunch & snacks, towels, park & porter fees and taxes. Moreover all our Open Water and Discover Scuba Diving students are covered by our dive insurance as standard. 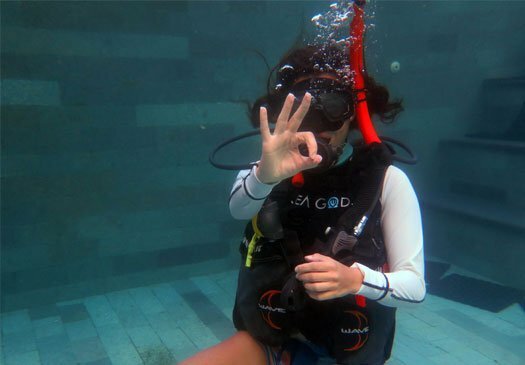 Free pick ups from your hotel in the Sanur en Kuta/Legian area are included for all courses, with the exception of the 1-2 hour Scuba Review, the Bubblemaker and Divemaster course. For pick ups in the Nusa Dua, Benoa and Seminyak area we charge extra as per above price list. Please contact us for other areas like Ubud. Please note all payments within Indonesia will have to be charged in Indonesian Rupiahs. * Price mentioned excludes PADI e-Learning cost payable to PADI directly. For 2019 this is AU$210 for PADI Open Water Diver, AU$195 for PADI Advanced Open Water Diver and AU$205 for PADI Rescue Diver. Discounted prices only apply when you link to Joe’s Gone Diving when purchasing eLearning. Prices may vary per region where you live. Contact us now to discuss your course options! NB. Prices can change without further notice.